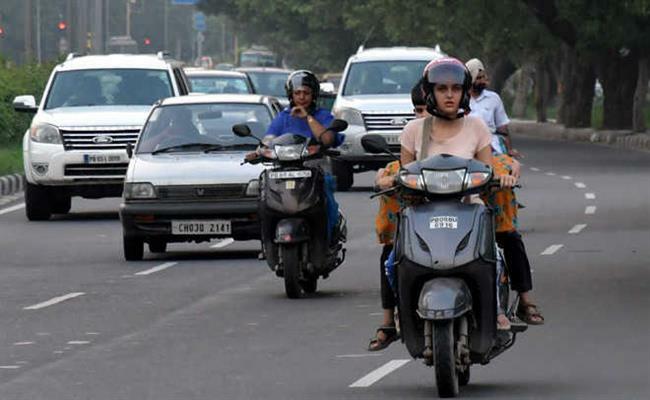 Chandigarh, August 29: The Chandigarh Traffic Police are finally going to start issuing challans to women riding two-wheelers without a helmet from September 5. Both the rider and the pillion rider will have to wear helmets. The UT Administration had issued a notification on July 6, making the helmet compulsory for women. Sikh women wearing a turban will, however, be exempted from challans. A police official said rules had been publicised widely and a drive to challan the violators would commence on September 5. “Both the two-wheeler rider and the pillion rider will have to wear an ISI mark helmet,” the police official said. To spread the message of the importance of wearing helmets among women, the police on Wednesday organised a scooter rally in which around 200 women two-wheeler riders participated. The rally was flagged off by road accident victims. It started from Post Graduate Government College, Sector 11, and after covering 30 km, it concluded at the college The police also distributed 200 helmets among the women two-wheeler riders. In a move to tighten the noose around traffic violators in the city, the Chandigarh Police will observe zero tolerance day on August 30. Cops from various wings have been directed to issue challans for traffic violations. According to an order issued by Shashank Anand, SSP (Traffic), besides the traffic staff, all police personnel posted at police stations, PCR vehicles and other field units have been asked to check traffic violations in the city and issue challans to the violators. The drive will begin at 8 am and continue till 8 pm.